In the early years of European settlement, two-fifths of New Zealand's Irish were Protestant (as compared to one-fifth in Ireland). This group were mostly loyal to England. They were often hostile to their Catholic countrymen, and formed organisations known as Orange Lodges. These were named after Protestant King William of Orange, who defeated the Catholic King James II in 1690. 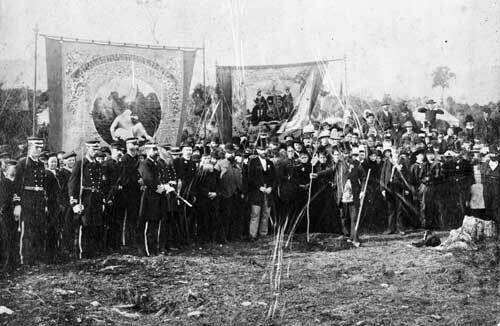 In this photograph, loyalist Orange Lodges gather in Charleston on the West Coast in 1868. They may be celebrating the escape of Prince Alfred, of the British royal family, from an assassination attempt by an Irish radical Fenian in Australia.